As I have mentioned before, I sometimes regret having omitted Latin Music from the scope of this site. At the time I decided to start doing this, I thought that I was pretty sure I knew all that I needed to know about the subject. And I have since been proven wrong. There’s a vast amount of amazing material out there. But I really do not need an excuse to buy more records than I already do. Maybe one of these days when I feel that I’ve got the rest of the world taken care of, I will turn my attention to that region. But the influence of Latin Music on the rest of the world is very evident. You can hear it in the Middle East in the music of Egypt‘s Salah Ragab and Iran‘s Manouchehr to South East Asia with Phoem Khlaibanleng & His International Mixed Mahori Orchestra of Thailand and the Non-Stop Dancing bands of Singapore with their cowbells and timbales… And of course, it can be heard in certain passages of Bollywood film songs (Really, what musical style has Bollywood not incorporated? Maybe Black Metal… But I’m not 100% sure on that.). But the biggest influence can be heard in Africa. And would be remiss in not mentioning Santana… I think I’ve heard versions of either Black Magic Woman, Evil Woman or Oye Como Va from just about every corner of the globe. There are two sites (That I know of – I’m willing to bet there’s a few more out there.) that cover the Latin Music that this site would cover – Garage Latino and Super Sonido. You can find information on Sinn Sisamouth here. Catalog number 45-5012 on Wat Phnom Disques of Cambodia. No release date listed. From the first time I heard “A2“ on Paul Wheeler’s Cambodia Rocks compilation on Parallel World, I knew something wasn’t quite right. It didn’t hit me until many years later, but something in my brain made a note and filed it away somewhere… Thankfully, due to an onslaught of Khmer Pop compilations in recent years, I have since learned that the name of that song was “I’m Sixteen“ by Ros Sereysothea. By now, anyone with even a passing interest in the popular music of South East Asia and / or Sixties Garage music has probably at least heard of Ros Sereysothea and Sinn Sisamouth. They were the Queen and King of Khmer Pop. That is, until the Khmer Rouge overthrew the Cambodian government on April 17, 1975. And while the rest of the world is only now discovering their music, their popularity in Cambodia has never really faded. Not too long ago, I stumbled upon a number of channels devoted to Khmer Pop on YouTube. 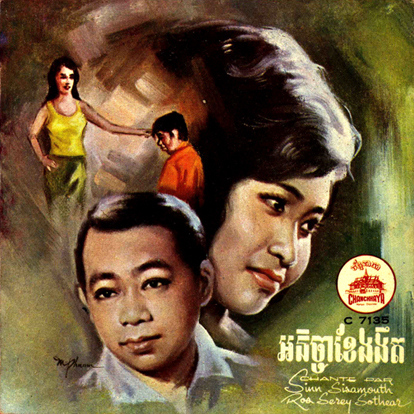 There, you will find loads of songs by Ros Sereysothea and Sinn Sisamouth as well as others. But on most of the songs, they have left the original vocals and replaced the music with a synthesizer and a drum box grafted on top of older recordings. How long have Cambodians been recycling their pop songs? 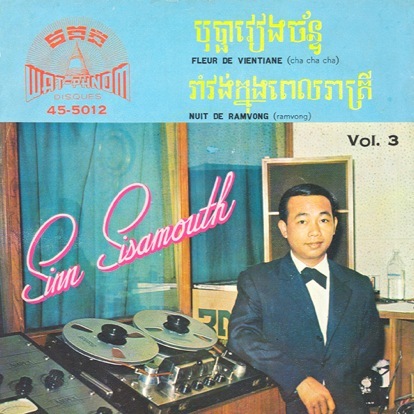 Since most of Khmer Pop collections of Sixties pop are compiled from old cassettes that have been floating around, most being dubbed copies with little or no liner notes, the sound quality is lo-fi at best. And as a fan of the music, you come to accept that. There are no master tapes. They’re all gone. But because of that fact, on many of these compilations the vocals and the instrumentation sometimes sound as if they were recorded at different times – perhaps even different decades. My suspicions were piqued even more when I picked up a copy of the “Cambodian Psych-Out“ compilation, released on Defective / El Suprimo. 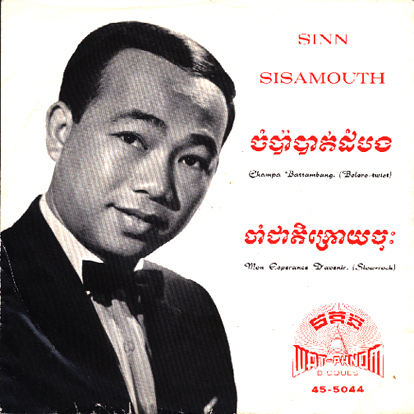 Besides the spelling discrepancies (Ros Sereysothea is spelled four different ways in the liner note – Sinn Sisamouth seven different ways), is the inclusion of the song “If You Wish To Love Me Don’t Laugh Or Cry“. This same song was entitled “If You Wish To Love Me“ on “Cambodian Rocks Vol. 2“, except their version does not have the xylophone (or is that a glockenspiel?) in the first part of the song. You can also tell that the guitars and drums have been re-recorded over the old track. When was this done? Who knows? Hopefully, whenever the documentary “Don’t Think I’ve Forgotten“ is finally released, maybe then will some of my questions be answered. Thanks to Vatthana Lim for the Khmer translation. Catalog number P. T. 111 on Bayon of Cambodia. No release date listed. Ros Sereysothea was from Cambodia. Born Ros Sothea in Battambang Province circa 1946, her family made a living by performing Khmer traditional music. Singing duets with her brother, Serey, the Serey-Sothea pair became quite well known and went to the capital Phnom Penh, where they found work performing in clubs. Ros eventually eclipsed her brother and became a solo artist, changing her name to Ros Sereysothea. During the 60’s and early 70’s, as the war in Vietnam threatened its borders, a new music scene emerged in Cambodia that took Western rock and roll and added the unique melodies and hypnotic rhythms of their traditional music. While these two songs are more on the tradional side, Sothea’s high, clear voice, coupled with the rock backing bands featuring prominent, distortion-laden lead guitars, pumping organ and loud, driving drums, made for an intense, sometimes haunting sound that is best described today as psychedelic or garage rock. On April 17, 1975, after taking over the country, the Khmer Rouge began one of the most brutal genocides in history, killing 2 million people – 1/4 of the Cambodian population. Intellectuals, artists and musicians were murdered simply for their status. Forced out of Phnom Penh with all the other residents, Sothea lived at a worksite in Kampong Speu. When her identity was learned by Khmer Rouge leaders, she was made to write and perform songs celebrating the regime. When she wasn’t singing, she was required to work at digging irrigation ditches like everyone else in the camp. And, she was forced by the insistance of Pol Pot to marry one of his assistants in 1977. She disappeared under mysterious circumstances during the brutal regime of the Killing Fields. Most believe that she died from being overworked in a Khmer Rouge agricultural camp, although it has also been reported that she either died of malnutrition in a hospital in Phnom Pehnh during the last weeks of the Khmer Rouge regime or that she had a fight with her husband and was sent away, never to be seen again. There is an extensive biography, with tons of pictures and MP3’s, as well as links to an interview with Ros Sereysothea’s sister and other YouTube videos HERE. Also, there is a short film about her life called The Golden Voice. And the documentary Don’t Think I’ve Forgotten has been in production for some time, but no release date has been announced. Thanks to Linda Saphan for the translation. 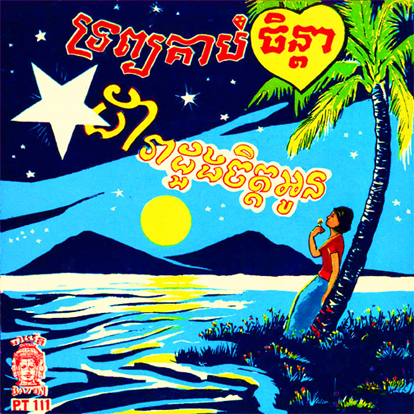 Catalog number C7135 on Chanchhaya Records of Cambodia. No release date given. Anyone even vaguely familiar with the music of South East Asia, has most likely heard of Sinn Sisamouth, who was from Cambodia. It is not known how many songs that Sinn Sisamouth recorded during his lifetime, but from 1972 to 1973 alone he published 500 songs. And that number does not include the songs he did for movie soundtracks or the duets he recorded with Ros Sereysothea and Pan Ron. The total number is estimated in the thousands, including many of which that were never released and only have recently been discovered. Besides being an accomplished songwriter, he was also a composer as well. He was known to use the Mandolin to search for rhythms to songs he was thinking of composing, and only later did he match lyrics to these rhythms. He was also known to have utilized up to three different dictionaries in searching for just the right word in the Khmer, Sanskrit or Pali language to include in his songs. His fame and success led His Royal Majesty Treyany to ask him to work for the king’s band, which he did until the coup d’état against Cambodia’s royal government in 1970. He then joined the Ministry Band of the Khmer Republic. There are many rumors concerning his death. It is not known for certain that he died at the hands of the Khmer Rouge, but some people suspect that the Khmer Rouge may have killed him along the road between Wat Champa and Phnom Penh, since most Cambodians who tried to return to Phnom Penh were killed. Only industry workers who possessed skills useful to the Khmer Rouge were spared; but when they outlived their usefulness, they too were butchered. Before the Khmer Rouge killed him, some people claim Sisamouth requested he be allowed to sing a song. He expressed himself as sincerely as possible through his music, but the Khmer Rouge soldiers were unmoved, and, after he finished singing, they killed him anyhow. Of Sinn Sisamouth’s three living children, only one has decided to make singing a profession. Sin Chaya, Sisamouth’s son, is currently a singer for the Cambodian Radio. He himself admits, however, that his singing cannot compare to that of his talented father. The only thing Sin Chaya claims to have inherited from Sisamouth was the desire and destiny to be a professional singer. For more information about Sinn Sisamouth, go to his biography at GoKhmer.com. And for more of his music, go to KhmerRocks.com. Catalog number 45-5044 on Wat Phnom Disques of Cambodia. No release date listed.